A soft sparkling beer with an aromatic and mild character. The silky shine and intense golden yellow hue of our Weisse, topped off with a compact and creamy head of froth, is a truly magnificent sight. Hacker-Pschorr has been brewing beer in the traditional Bavarian manner since 1417. The high-quality beers the brewery produces are all brewed in accordance with the Bavarian Purity Law and contain only water, malt, yeast and hops. By Munich law, only the six breweries within the city limits of Munich are invited to serve their beer at Oktoberfest. 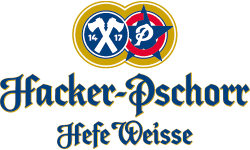 Hacker-Pschorr is one of the six, as is its sister brand, Paulaner.